Silence, sanctuary and safety were promised at our board retreat at the Society of St. John the Evangelist Monastery near Boston. Together, we built trust and an environment where we could risk being open, vulnerable, known and transparent, without rejection. The monks at St. John believe much of what is said doesn’t need to be said … or worse, inflicts damage. We feel that in divorce work. So monks live silently much of the time to “defrag the soul.” The brothers specialize in “giving care to caregivers,” punctuating our silent retreat with discussions on wonder, contentment, gratitude, and seeking help for ourselves. We also attended the monks’ prayer services and hiked the more than 144 acres of waterfront property full of rolling hills, organic vegetable gardens and farm animals. Monks’ quarters are off limits, called an enclosure. We were encouraged to build enclosure in our lives, a sacred space where technology cannot reach us, where we are not available 24/7, and where we communicate this. Awaken to each day as a gift, not a given, with a sense of adventure. Live into yes. Gratitude is the single most powerful way to live. You can also use it as a buffer so that clients don’t infect you. Take nothing for granted. Your eyes can read these words. You can sit independently in your chair to read them. Your legs will work when you stand. And you are breathing without help. You are a walking miracle. Sunrises come out of pitch darkness. Rather than strive to live one day at a time, how about living one moment at a time, not holding our breath or living with the clutch in? Focus on now. We may not have the next moment, but we have now. The next will take care of itself. As we age, we tend to delve deeper into what we love, focusing our talent like the water nozzle on a hose, instead of trying to master it all or travel everywhere as we may have done in earlier years. Experience life with eyes of amazement. We have potable water. The left handle on the faucet makes it hot. You can barely take a step in life without gratitude. Gratitude doesn’t deny or eliminate incredible difficulties, but can give us new energy to bear suffering. Respect the dignity of every human; the smallest comment can give people dignity. Address the royalty, and the royalty will appear. We cannot change or transform clients. We can only decide, this is how I’m going to comport myself. Say you’re welcome when someone thanks you. You gave the best you had in the moment, and you’re welcome implies there’s more beyond that. We thought we would need less help as we aged. Instead, we need more. Get help. What did you deeply enjoy as a child, and where is there an invitation to reconnect with that deep joy? The monks live by “rules,” or principles that govern their rhythm of life. Frontload your priorities. Otherwise, you can get lost. This also helps you discern when to say yes. What may be good for you (ie. it would build more business) may not be right for you. Balance in life can be very difficult to achieve, but even more difficult if you don’t achieve it. Fear is greatly overrated. It’s not worth your attention. Freedom is found in the context of limitation. What is now is enough. Rather than use desire to imagine something else, claim what you have. This is what you want. This is what you need. Desiring certain outcomes consumes a great deal of energy and can lead to resentment, anger, and sadness when you don’t get your way. With every breath, receive what you need, and release what you don’t. Breathing in, I calm my spirit. Breathing out, I smile. Dare to enjoy your life. Say yes to the life that is handed you, instead of holding onto the life you thought you’d have. People can be contagious. Be affected, not infected, by clients. Sometimes a symbolic act like washing hands can protect you. On meditation: Every day, half an hour’s listening is essential, except when you’re very busy. Then a full hour is needed. Be kind to yourself. You’re the best you’ve got. Incorporate a Sabbath into life, a sanctuary of time every day, every week, every month, every year. Don’t just live on the advance. Retreat. It allows you to respond to life, not just react. Engage with poverty. Plan how to steward and share your money and talent. Take in beauty and order to redress the messiness and carnage in our careers. Be intentional about cleansing your soul. For those interested, please visit www.ssje.org. TBACP Board Retreat at Emery House with Brother Curtis in Massachusetts. A wonderful weekend! 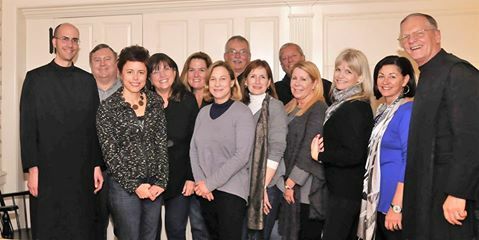 — with Cole Jeffries, Tina Tenret, Caroline Black Sikorske, Nancy Harris, Ellen Ware, Ky Koch, Christine Derr and Odalys Lara at Emery House, West Newbury.